Tulipa saxatilis Sieber ex Spreng. is distributed from the southern Aegean Islands to western Turkey. 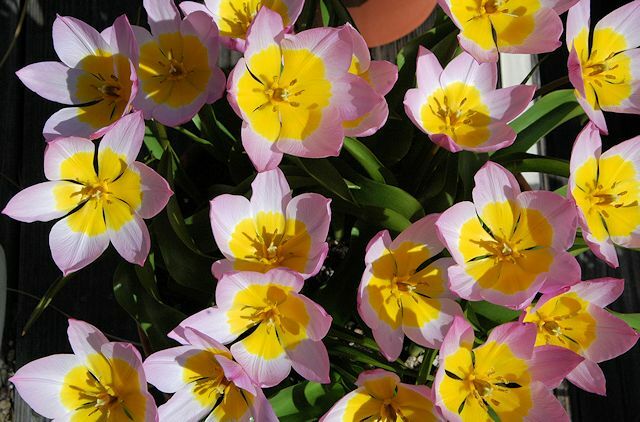 Flowers are pink to lilac-purple with a large yellow blotch. Tepals are cup shaped, but in sunshine open flat. It grows in rocky places below 900 m (2950 ft) and is often found on the sides of gorges. It is stoloniferous and in cultivation can produce more leaves than flowers. 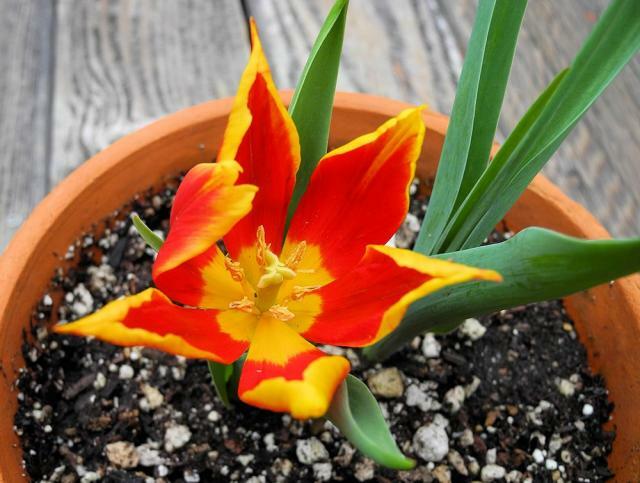 Wilford in Tulips: species and hybrids for the Gardener recommends growing it in a hot, sunny position in well drained soil and confining it between rocks to promote better flowering. It is considered to be hardy. 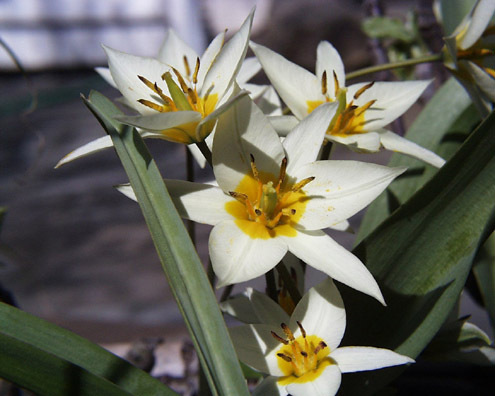 Tulipa bakeri A.D.Hall is now included in Tulipa saxatilis which led some to consider it to be a subspecies and it was named ssp. bakeri (A.D.Hall) Zonn. 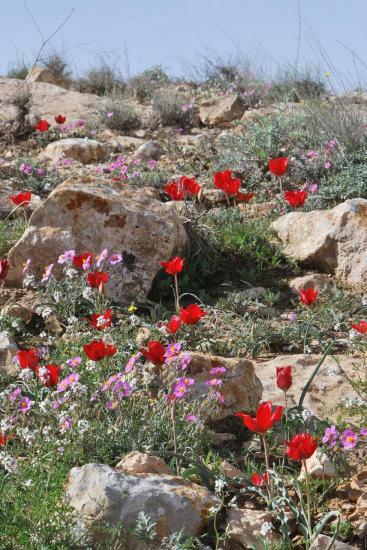 This form is native to Crete and grows at higher elevations than the other subspecies and is found on the high flat plains, on field margins and rocky slopes and screes. Flowers are a deeper pink than other forms and the anthers are orange-yellow instead of brown. Most authorities do not recognize this form as deserving of subspecies status. The first photo below from Arnold Trachtenberg. 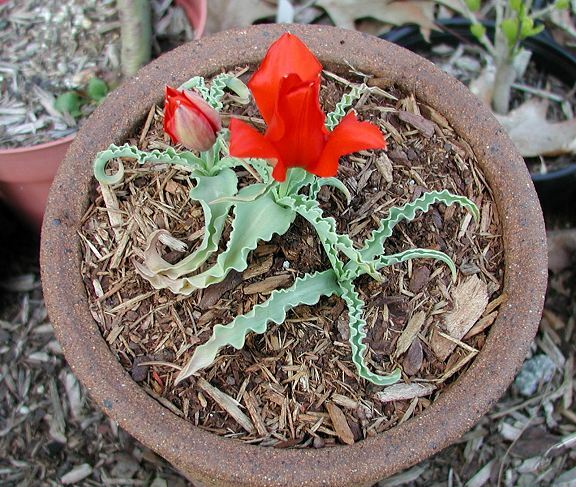 The second photo below was taken by Mark McDonough who gardens in northern Massachusetts, USA, USDA zone 5. He writes about it: Growing under the shade of dwarf Japanese maple, the lilac pink and yellow flower color shows up best with some shade. 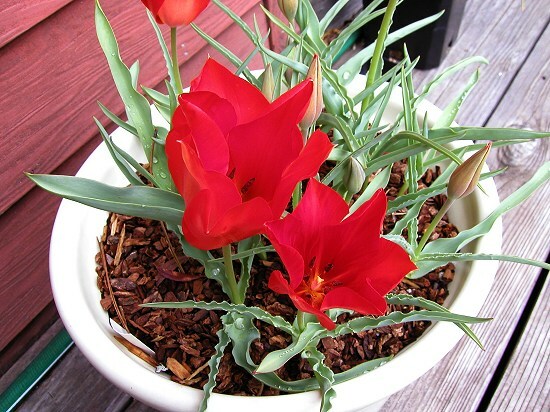 I find the foliage too wide, tall, and coarse compared to other dwarf tulip species. 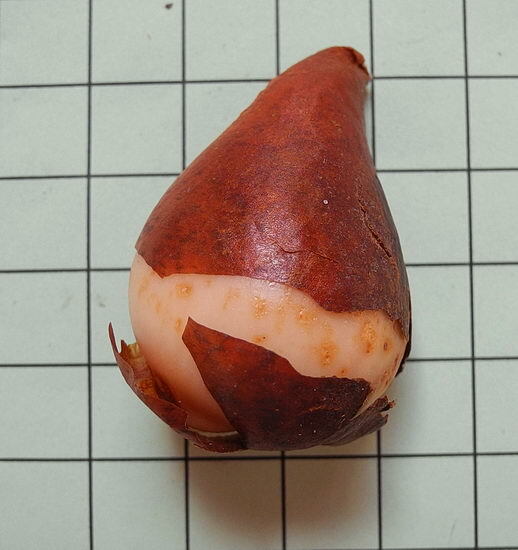 Bulbs were interplanted with T. tarda, my attempt at succession bulb planting, where this species takes over after T. tarda has finished blooming. Lovely, but the flower color seems washed out in sun. The cultivar of the bakeri form, 'Lilac Wonder', is a popular garden plant and easily grown and is a winner of the RHS award of garden merit. Photos from Mary Sue Ittner of this cultivar. The first five were taken five different years. The last shows the bulbs on a 1 cm grid. 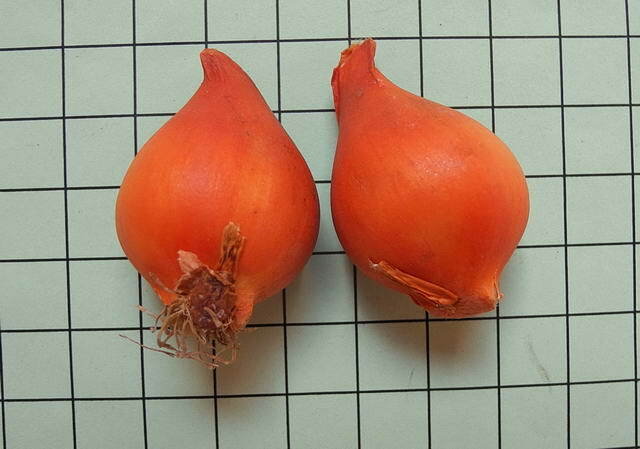 Tulipa schrenkii Regel is considered to be a synonym of Tulipa suaveolens Roth by many authorities. Its range extends from the European part of Russia through the Caucasus to western Siberia and central Asia. It was described in 1881 and named after Alexander Schrenk, a researcher at the Botanical Garden of St. Petersburg. It has three or four glaucous, undulate leaves and a solitary flower. Wild forms can be red, pink, and yellow. The form in cultivation has scarlet tepals edged orange-yellow. The leaves are only 10 cm long, but the flowers are much larger than expected for such a small plant. 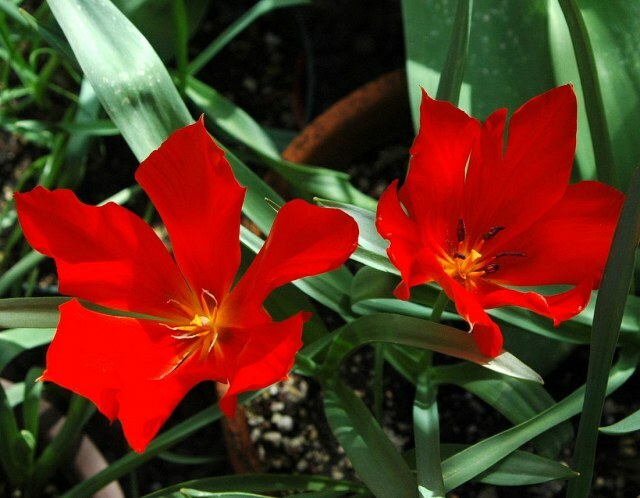 Although Tulipa suaveolens Roth was described earlier (1794), it was named for a cultivated tulip of unknown origin. That plant could have been a hybrid. A case can be made to call this plant by either name. 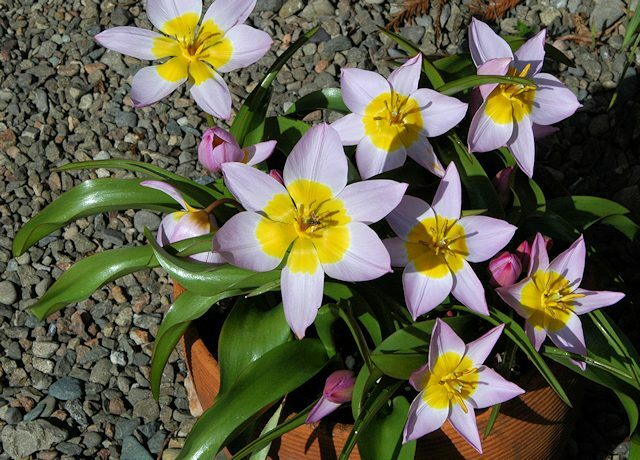 It can still be purchased as Tulipa schrenkii and the photos below taken by Mary Sue Ittner including a bulb on a 1 cm grid were for a plant sold under this name. 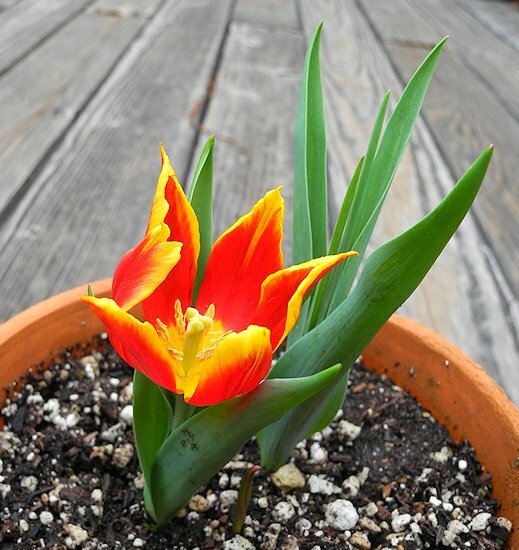 Tulipa sprengeri Baker is a tulip that was described by Hall as having a more than usually interesting history in cultivation. 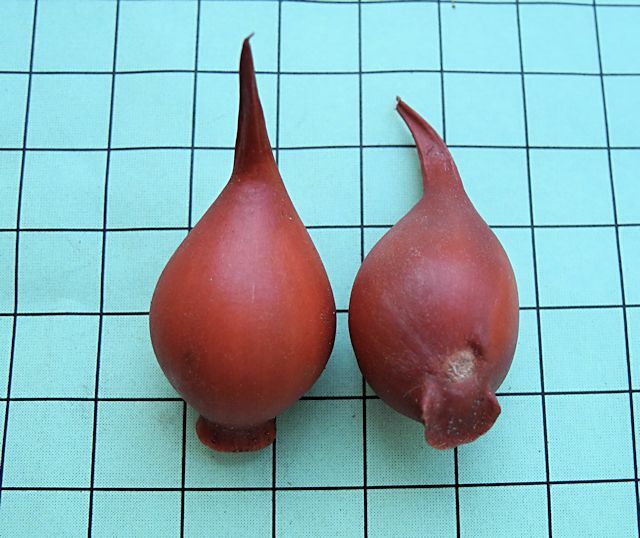 A single bulb was found in a shipment to the Dutch bulb firm of Van Tubergen from their collector in Turkey, J. J. Manissaadjian before World War I. It has been traced to the region about Amasya, but has never again been found in the wild. 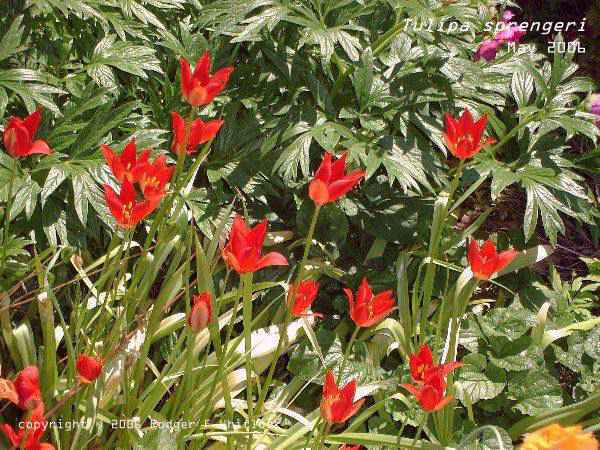 Curiously, Tulipa sprengeri does very well in some gardens, seeding about with freedom and has been awarded the RHS award of garden merit. 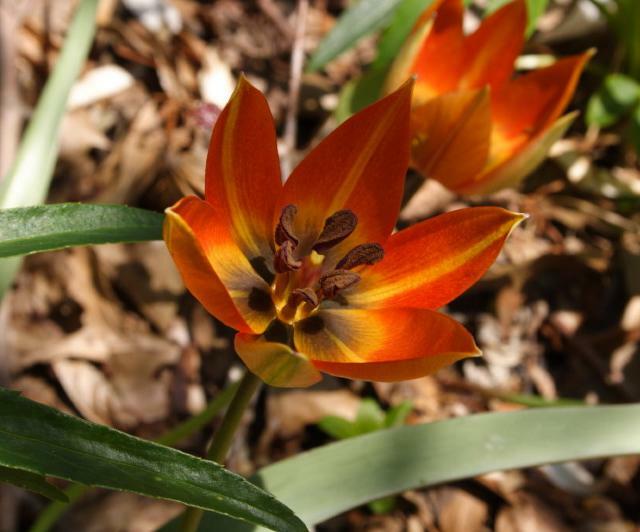 So much freedom, in fact, that in the early 1950s, E B Anderson, who was then administering the first seed exchanges of the Alpine Garden Society, specifically asked that seed of Tulipa sprengeri not be donated. 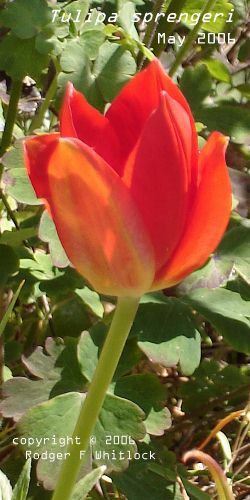 Nonetheless, when one looks through the standard references on species bulbs, Tulipa sprengeri is often noted as rare and/or expensive. 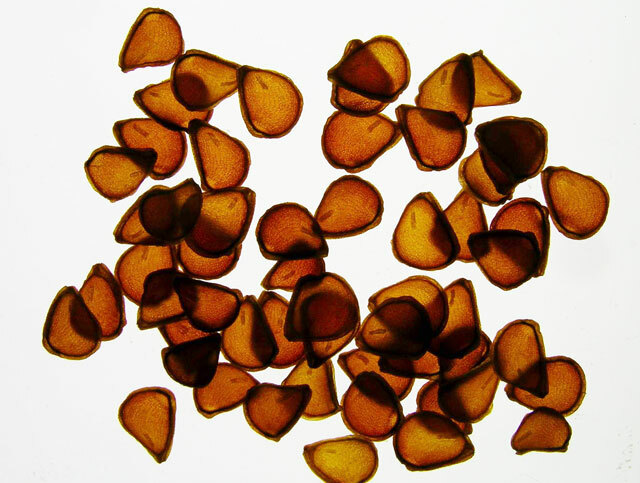 It is very odd that a species that seeds so freely in gardens is evidently extremely rare in the wild. On the other hand a number of people have found it very challenging to grow from seed so it may need special conditions to prosper. 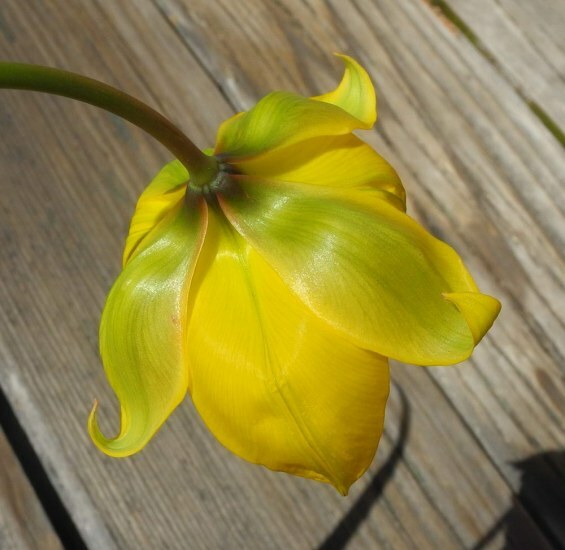 This species is the last tulip to flower. 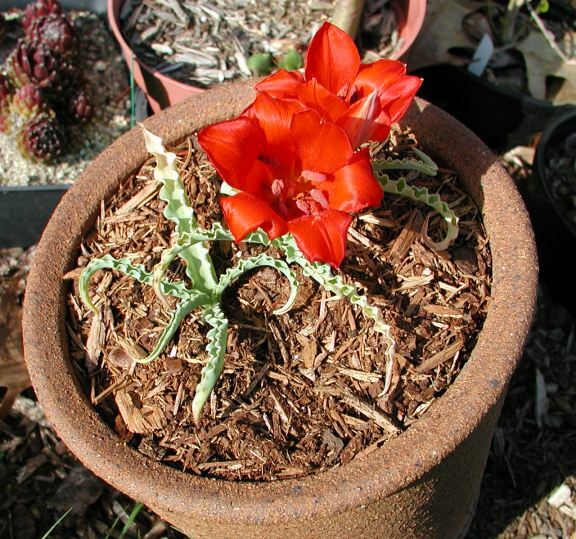 Its flowers are a unique glowing red, rather small but on fairly long stems so its personality is a good one. If you grow it, beware: it will turn up in unexpected places unless you meticulously deadhead it and prevent seed from scattering. 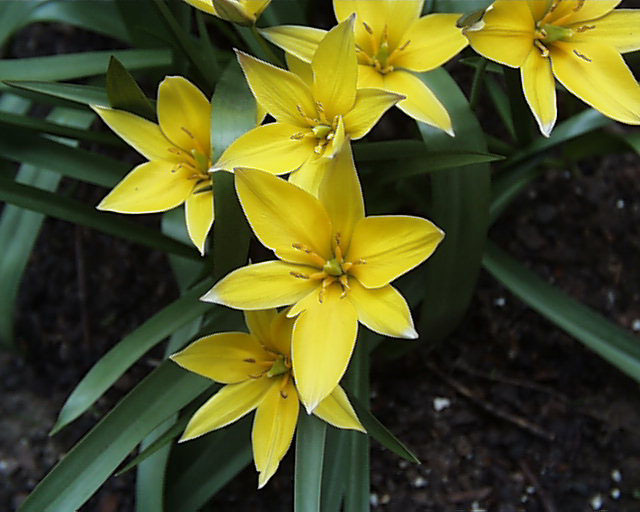 As with some other bulbs, Tulipa sprengeri digs itself down to quite a depth and can be difficult to remove from sites where it is not wanted. 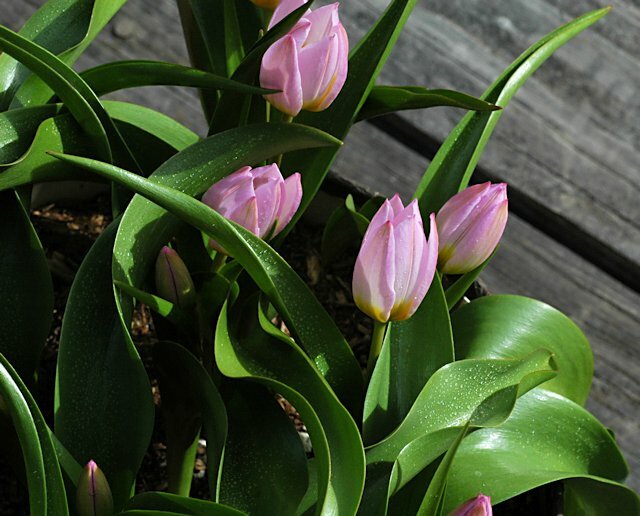 The first two photos in the link below is intended to give some idea of how this tulip looks in a garden setting, while the third is a closeup portrait. The first one does not adequately capture the unique glowing color, however. The others capture the true color fairly faithfully, thanks to turning down the saturation on my camera. Photos 1-3 by Rodger Whitlock. Photo 4 from Hans Joschko. Photo 5 of seed using transmitted light and photo 6 using reflected light by David Pilling. 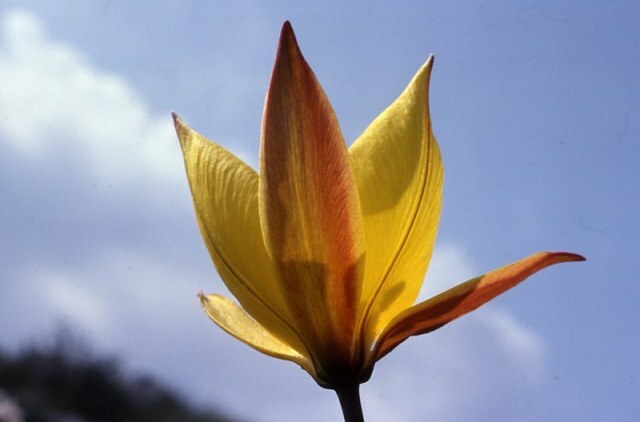 Tulipa stapfii Turrill is now considered by most authorities to be a synonym for Tulipa systola Stapf. 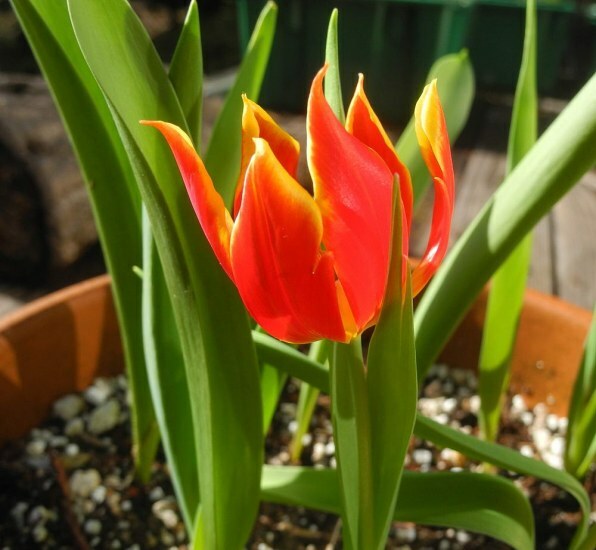 Native to Iran, this beautiful dwarf tulip is considered a form of this variable species differing in having more and also wider leaves, crowded near the base. 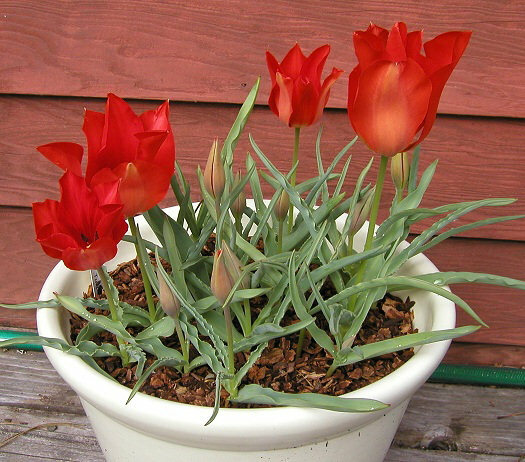 This tulip bears solitary, dark crimson-scarlet, bowl-shaped flowers on sturdy upright stems which have several narrow pointed leaves. Photo by Ian Young. 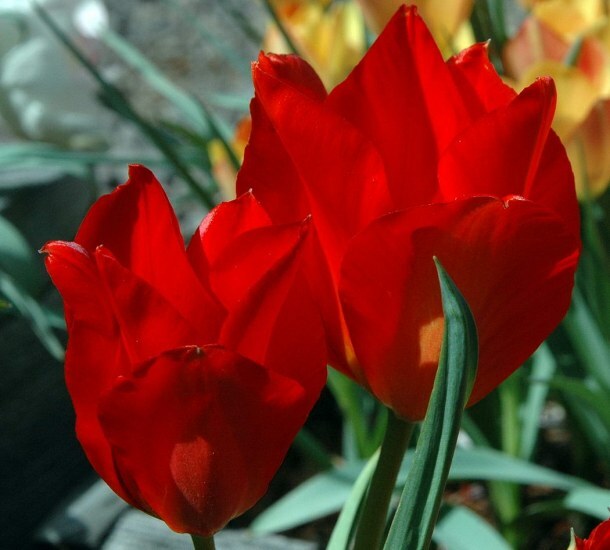 Tulipa suaveolens Roth was the name given to a cultivated tulip of unknown origin by Albrecht Roth in 1794. 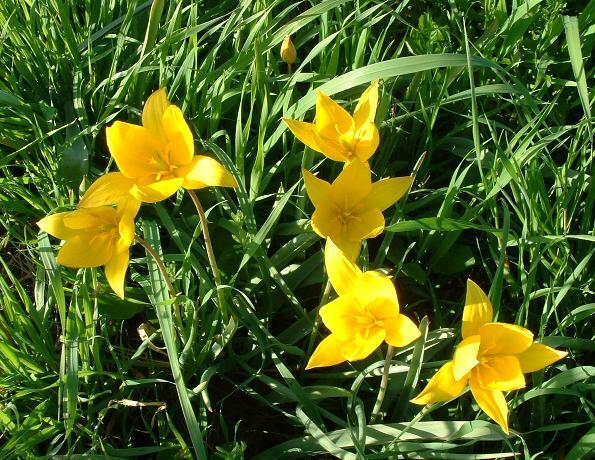 This species name has been used for a range of wild, dwarf, early tulips that were introduced from southern Russia, including Tulipa schrenkii. Photo from Mykyta Peregrym from a natural heritage site in Ukraine and shared under a CC BY-SA 3.0 Unported license. Tulipa sylvestris L. is a rather common presence in wheat fields, to the point where it has naturalized. The bulbs of this species grow particularly deep, over 50 cm, and are able to survive the plowings of the fields without problems. Also it completes its growing cycle, from flowering to ripening seeds, before the wheat is harvested. As a result of the feeding, the plants often develop multiple-flower head stalks, just similar to the modern Multiflora tulips. Curious to see, the plants were only in cultivated fields, while they weren't in adjacent intact lands. Photos 1-3 were taken in habitat in Apulia by Angelo Porcelli. Photo 4 from Hans Joschko. Photo 5 by Kathleen Sayce shows a back-lit batch of seeds, showing the embryo within. 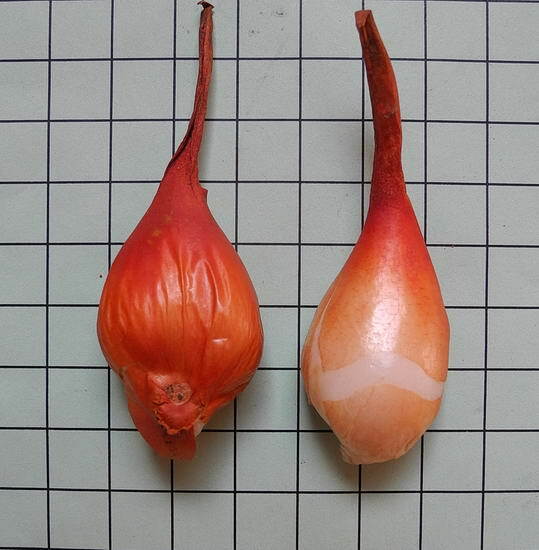 The first four photos from Mary Sue Ittner showing the front and back of the flower and bulbs on a 1 cm grid. 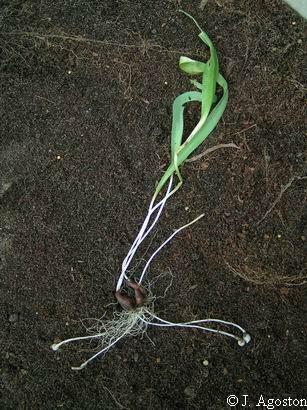 The last photo from Janos Agoston shows new bulbs produced by stolons. 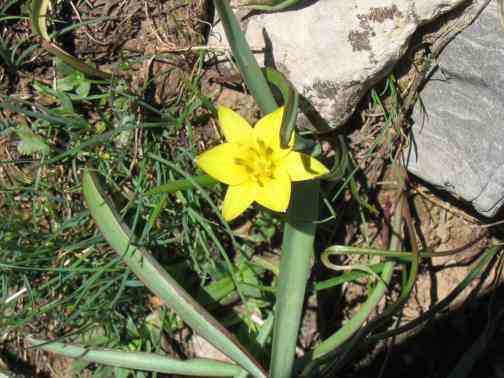 Tulipa sylvestris ssp. australis (Link) Pamp., syn. 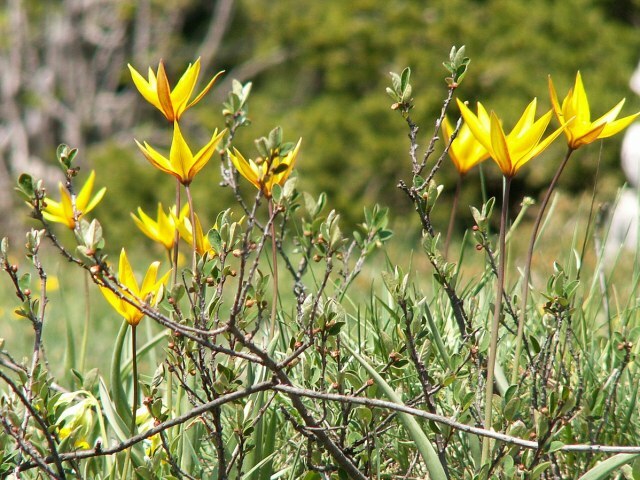 Tulipa celsiana Redouté, is found in rocky places in the central and western Mediterranean region. It has smaller flowers infused red on the outside. 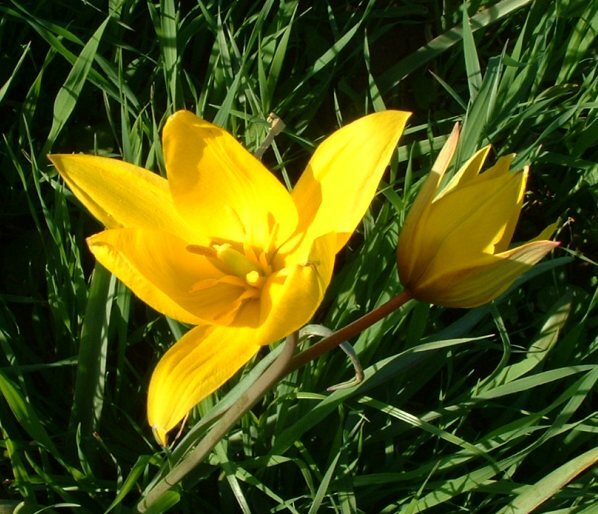 Photos taken by Chantal Tasson in France and shared under GNU GPL license and by Colin Barker for what was previously Tulipa celsiana under CC BY-SA 3.0 license. Tulipa systola Stapf. is from Israel, Turkey, and Iran. It is found on mountain slopes, among rocks, in forest clearings, and in deserts. 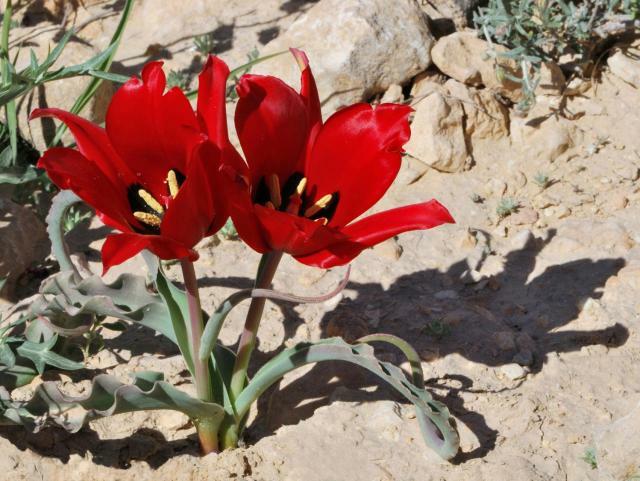 In Israel it is known as the Desert Tulip and is very dependent on rain in order to flower. 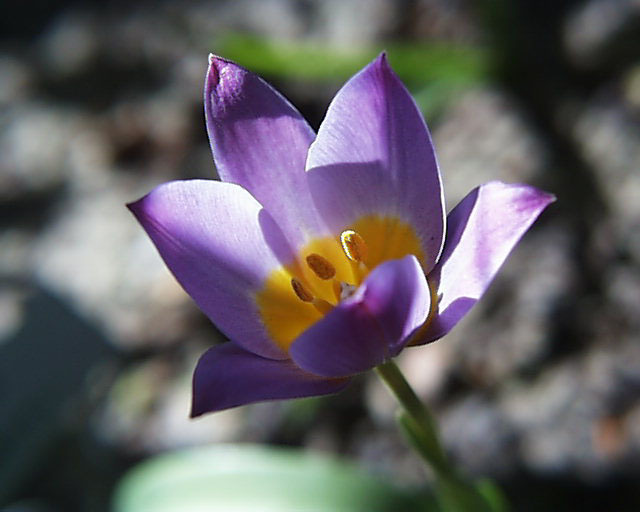 Tulipa stapfii Turrill, named from plants found in Iran is now considered by most authorities to be a synonym of this species. Photos by Gideon Pisanty. 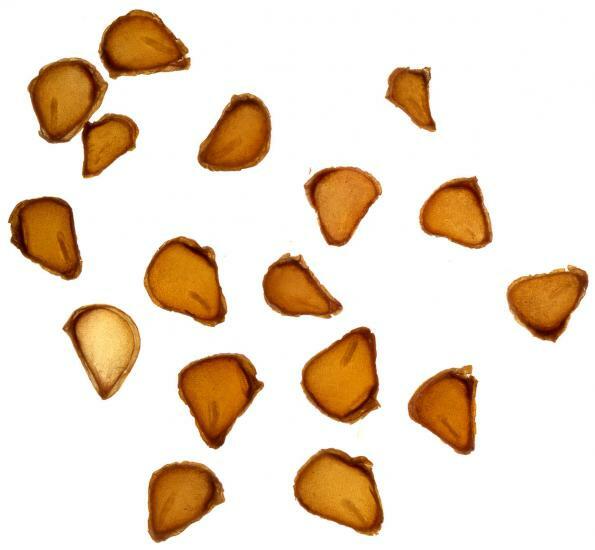 Tulipa tarda Stapf is considered by many resources to be a synonym of Tulipa urumiensis Stapf. 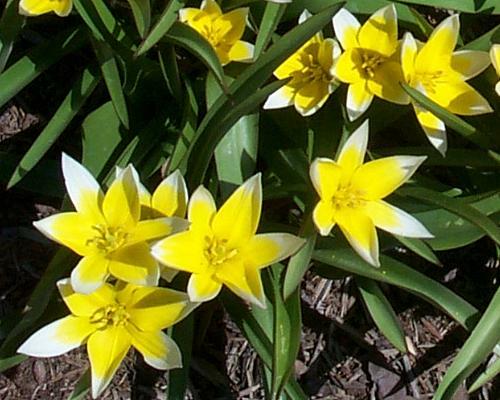 Tulipa urumiensis has yellow tepals, which is the only difference from the partly white tepals of Tulipa tarda. It is a species from central Asia and a winner of the RHS award of garden merit. Mark McDonough writes: "I've had this patch for many years. 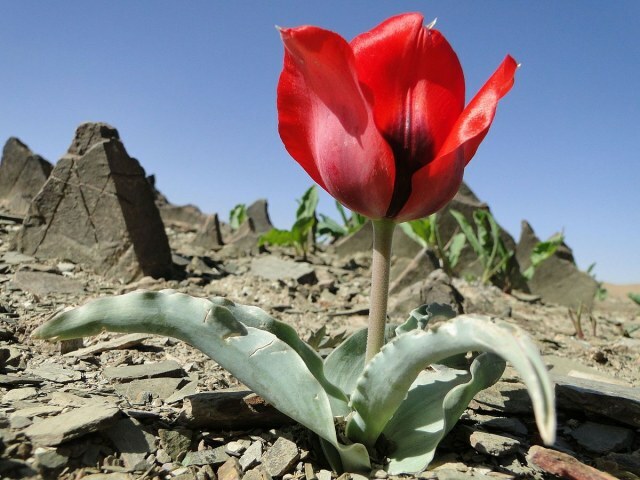 This one gets my vote for best, most long-lived tulip species for rock gardens." 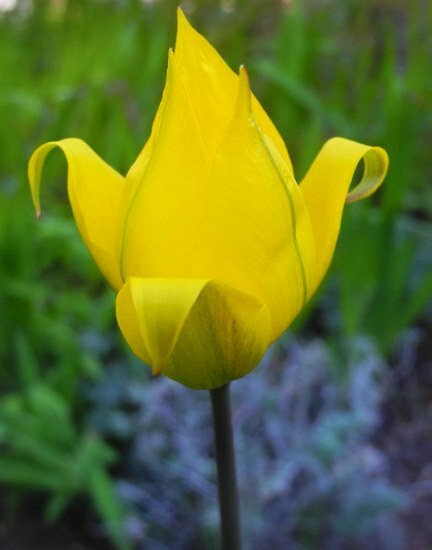 Photos by Mark McDonough show a close-up view of the yoke yellow flowers with white tips and in the second photo some larger larger leaves of T. bakeri 'Lilac Wonder' which are "succession interplanted" among the Tulipa tarda patch. 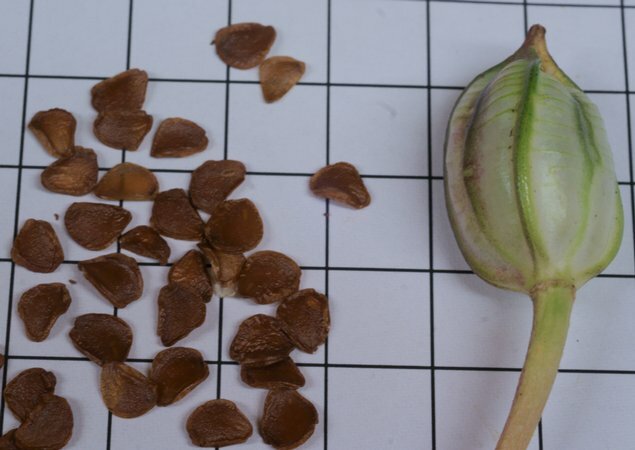 Photo 3 of seed and seed pod on a 10 mm grid and photo 4 of shoots by David Pilling. Video time lapse by David Pilling, taken on the 30th. April 2013 from 14:12 to 18:11 of flowers closing as shadow passes over garden. Narcissus 'Jet Fire' in the background. 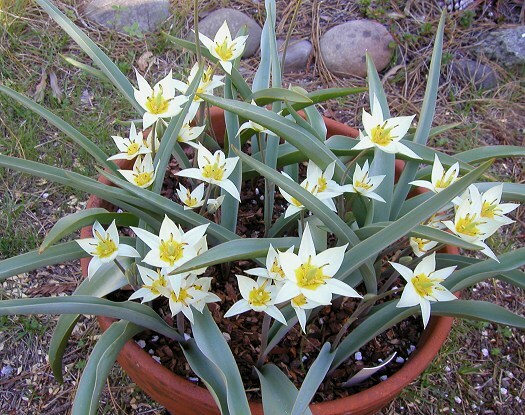 Tulipa turkestanica (Regel) Regel as its name suggests is from Turkestan and northwest China. It is a winner of the RHS award of garden merit. It has one to 12 starry white flowers per bulb. Photo one by Arnold Trachtenberg shows one growing in New Jersey. Photo 2 was taken by Janos Agoston. Photos 3-4 were taken by Mary Sue Ittner. The last shows the bulbs on a 1 cm grid. Photos by David Victor of this species growing in the wild on the western Tien Shan mountains, Kazakhstan, in June 2004. These shots were taken at the top of the Ulkun-Kyindi Pass at around 10,000 feet. The species comes in a pure yellow form or, more frequently, yellow with white tips to its petals. I have included photos of both. 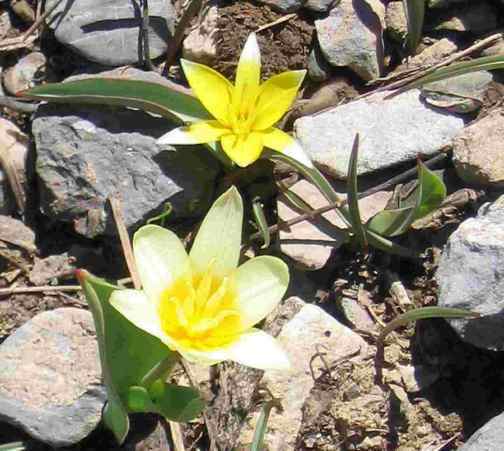 The final shot shows Tulipa turkestanica (above) growing alongside Tulipa kaufmanniana (below) in the same location. 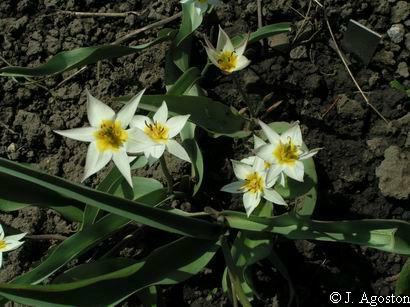 Normally, however, Tulipa turkestanica seems to prefer a cooler western exposure, compared to Tulipa kaufmanniana, which seems to prefer southern aspects. 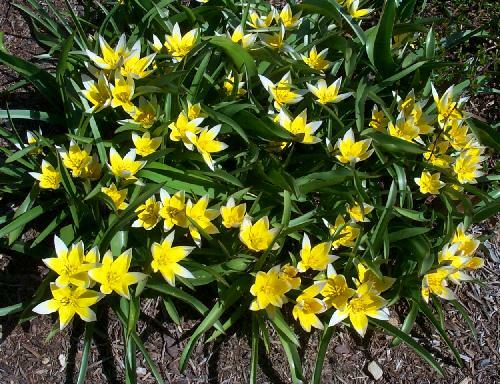 Tulipa undulatifolia Boiss. is distributed from the Balkan Peninsula to Turkey, Transcaucasus, Iran to Central Asia. 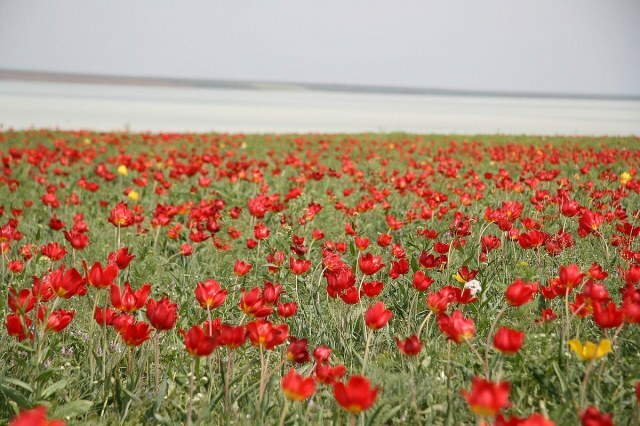 Richard Wilford describes it as a weed in Turkey to the southern Balkan Peninsula. 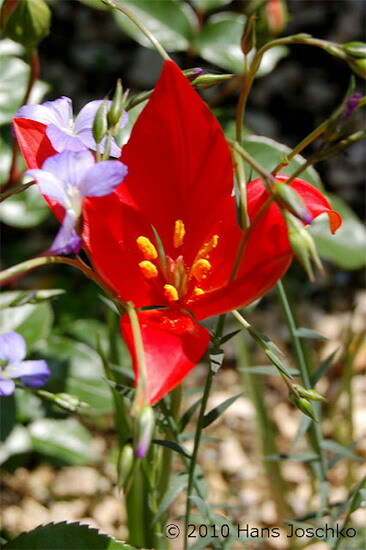 It has three or four glaucous leaves with undulate margins and orange-red to scarlet flowers with a black blotch inside surrounded by a yellow margin. 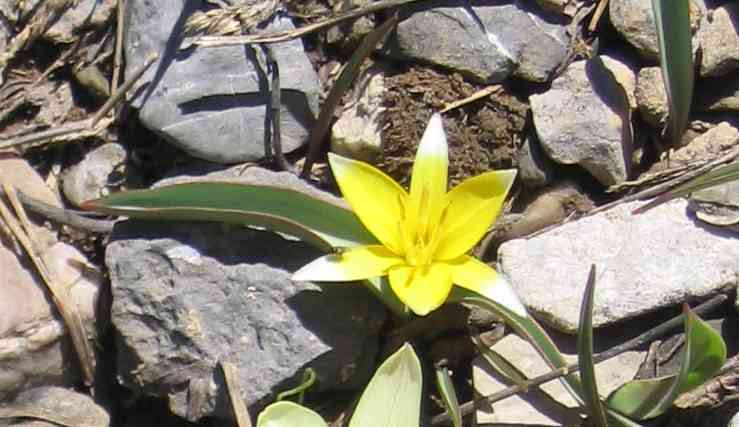 Tulipa undulatifolia var. micheliana (Hoog) Wilford, published in 2013, syn. 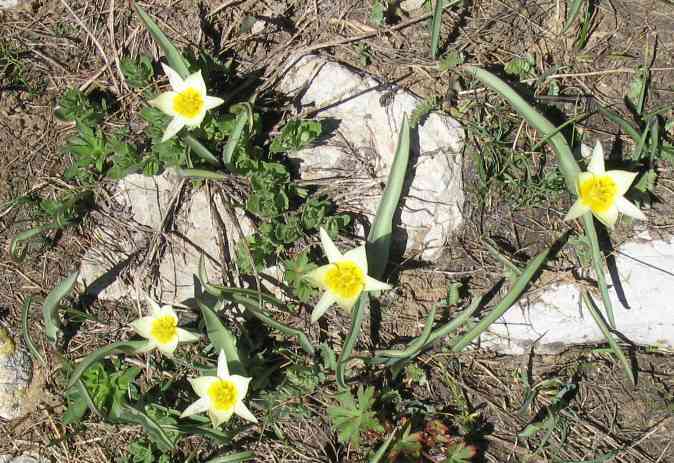 Tulipa eichleri var. micheliana (Hoog) Raamsd., syn. 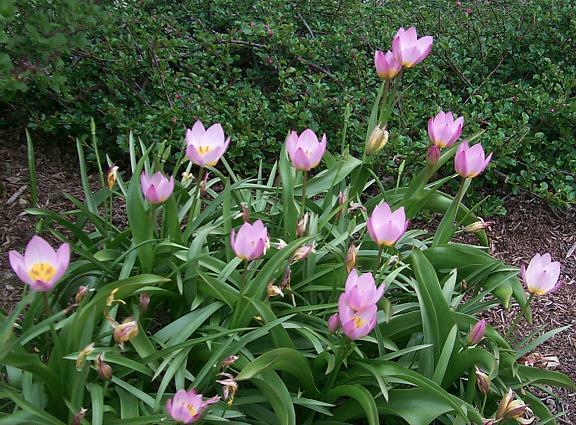 Tulipa micheliana Hoog, has a native range from Central Asia to Iran. It differs in having striped leaves. Photo taken by Smrazavi found in Wikimedia Commons and shared here under a CC BY-SA 4.0 license. 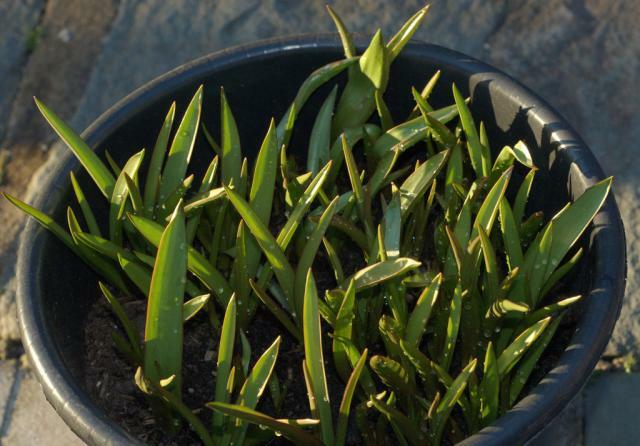 Tulipa undulatifolia var. 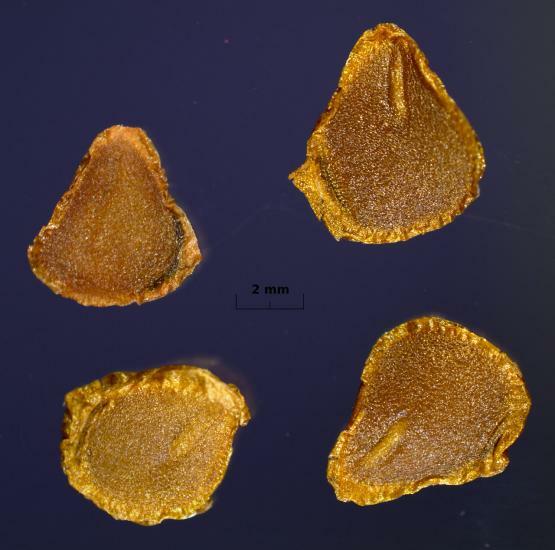 undulatifolia has a native range from the southern Balkan Peninsula to western and central Turkey, and eastern Transcaucasus. 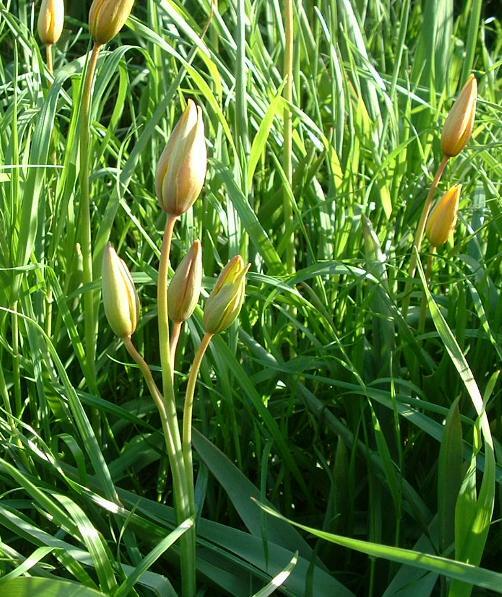 Tulipa eichleri Regel is now considered to be a synonym of Tulipa undulatifolia var. undulatifolia by most recent authorities. Tulipa uniflora (L.) Besser ex Baker was first described in 1874. It is found in thickets and on exposed stony slopes up to 2400 m in Kazakhstan, Siberia, China and Mongolia. 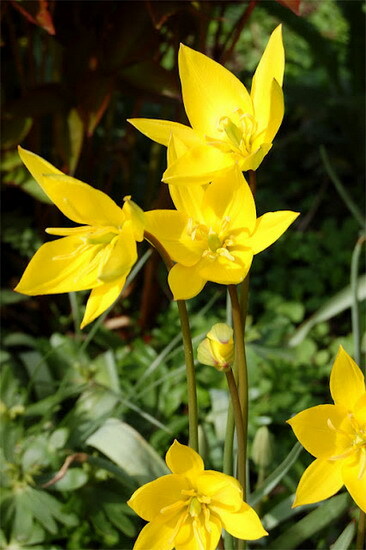 Growing from 10 to 20 cm, it has small yellow solitary flowers and is included in the subgenus Orithyia along with Tulipa heterophylla and Tulipa heteropetala. 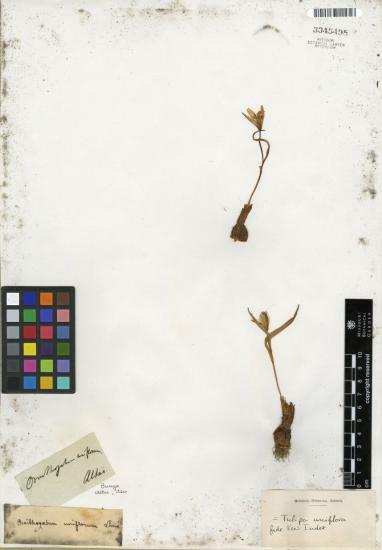 Herbarium specimen below courtesy of the Missouri Botanical Garden (CC-BY-NC-SA). 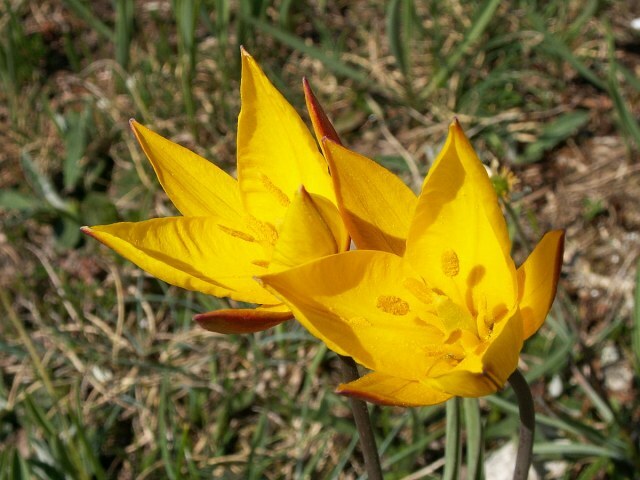 Tulipa mongolica Y.Z.Zhao was described in 2003, but it is considered by authorities to be a synonym of this species. 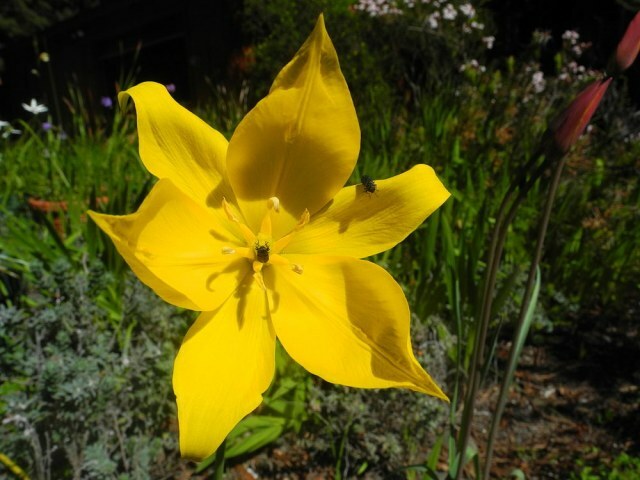 Tulipa urumiensis Stapf is a dwarf species from Iran and Turkey with narrow leaves and bright golden yellow flowers. 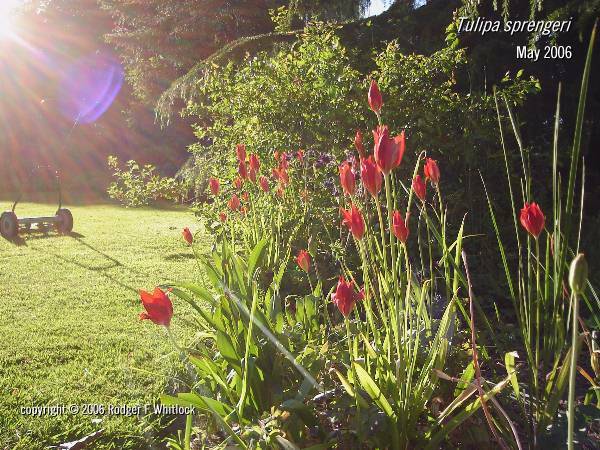 Tulipa tarda is considered to be a synonym. Both have won the RHS award of garden merit under the separate names. Photo by Arnold Trachtenberg who gardens in New Jersey. 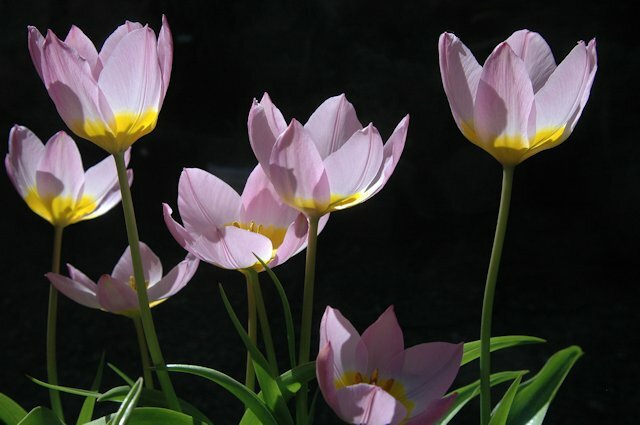 Tulipa vvedenskyi Botschantz. 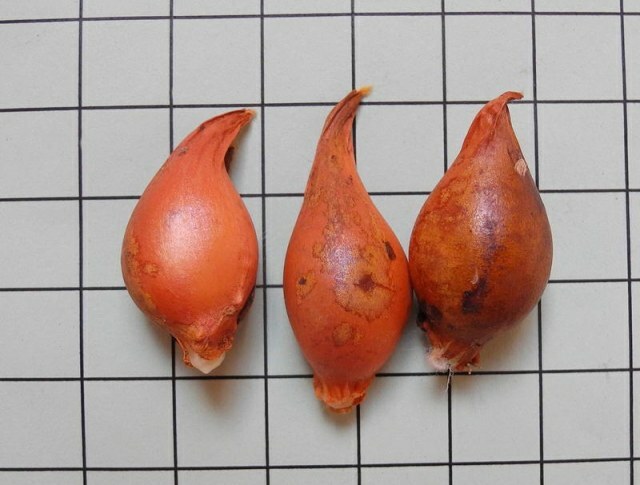 has prostrate wavy edged leaves and bright orange red flowers and is from Soviet Central Asia. 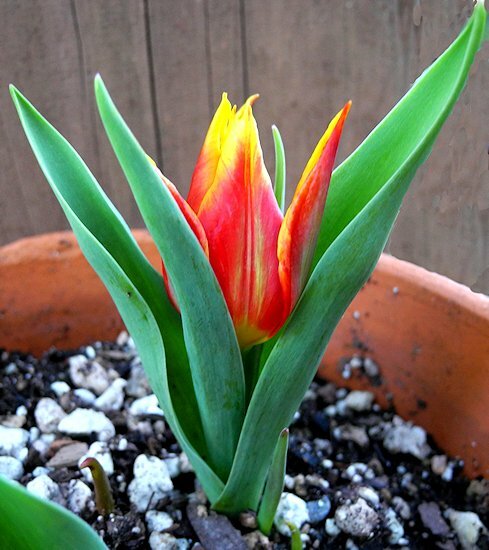 There is a hybrid of this species pictured on our Tulipa Hybrids page. Photos by Mark McDonough who writes: "The foliage, stem height, and flower color can vary quite a bit in this species. The form shown here is very short compared to other forms I have seen grown by gardeners in my area. One of the hallmarks of this species is the wonderful undulate foliage." Photos from Bob Rutemoeller and Mary Sue Ittner show descendants from original plants grown over many years (and prechilled before planting.) In subsequent years the foliage has become smooth, not undulate. The last photo from shows the bulbs on a 1 cm grid. 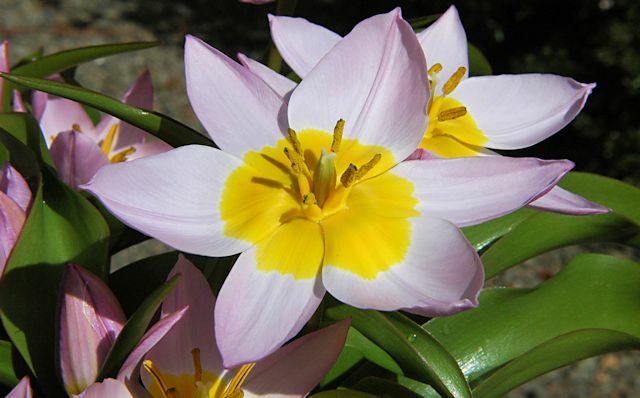 Tulipa whittallii A.D.Hall is considered by authorities to be a synonym of Tulipa orphanidea Boiss. ex Heldr. 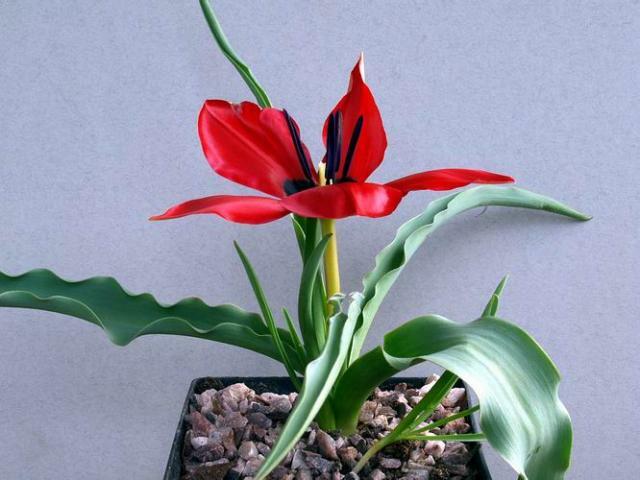 It is a tetraploid clone of the Tulipa orphanidea group which was found near Izmir, in western Turkey. 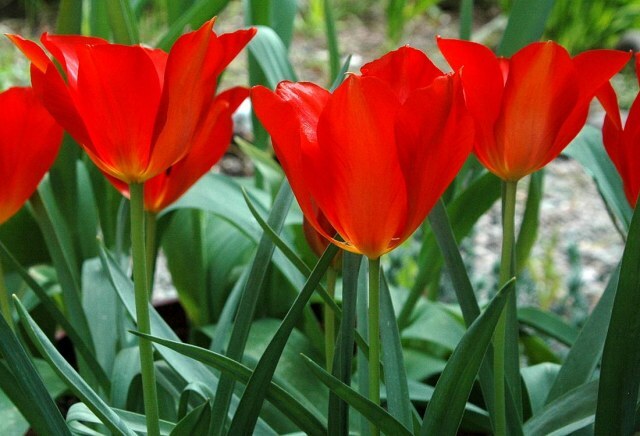 In fact, it resembles the tulip known as Tulipa hageri more than it does T. orphanidea, although Tulipa hageri itself is often considered to be a form of T. orphanidea. Photographed by Jim McKenney in his USDA zone 7 Maryland garden, where it has persisted for several decades and spread by stolons to form a loose six-foot wide patch under deciduous magnolias.